My father, who owns a plumbing company, despises garbage disposals because he says they are nothing but trouble waiting to happen (stopped up drain). A professional firefighter friend doesn’t have any power strips in her house (fire hazard). Professional dog trainers, too, do a lot of things very differently than pet owners. Why do professionals do things differently than non-professionals? I think it’s because professionals see so much more in their field than the non-professional. The plumber knows just how many house calls are due to garbage disposals. The firefighter has arrived on-scene to a fully engulfed house where the cause of the fire can be traced back to a power strip. And dog trainers, well, we see so many easily preventable problems – problems that can wind up causing big headaches or costing lots of money (or in the worst cases, loss of the dog’s life). This month, we’re talking about the professional dog trainer’s “Don’t Do This” list. They teach bad habits. Flexible leashes teach your dog to pull on the leash to go anywhere. They encourage pulling. If you’re trying to teach your dog to walk nicely on a leash, the best way to wreck that is by putting your dog on an extendable leash. The leash is always tight. If the dog wants to move anywhere, there is tension on the collar and the dog has to pull into the collar to move. It’s a recipe for disaster if polite leash manners is your goal. They are dangerous. The thin cord can amputate (yes, chop off) your finger! Or your dog’s tail or toe. If you’re not squeamish, Google “flexi leash injuries” and click on “Images” to see all the damage that a Flexi leash can do to flesh. They’re way too long. Some of the leashes extend to 26’! If your dog is more than 6’ away from you, there is greater likelihood that your dog could get into trouble: he could run into the street (still on the leash), could rush up to another dog who isn’t friendly, or get himself into something dangerous (mouse poison, antifreeze, wild animal, etc.). The reasons are plentiful, those three are the most common and most dangerous of the reasons to not use a Flexi. Just say NO to Flexis. The only dog parks most dog trainers will use are empty ones. We know that dog parks are havens for inappropriate behavior (canine and human) and disease. Ew, need I go on – those two things right there are enough to convince this human that my dogs do not need to visit a dog park. But here’s more detail, in case you’re on the fence about dog parks. Dog fights. Not every dog that goes to a dog park should be there. Some owners take their dog to the dog park so they’ll “get used to” other dogs. Or to “socialize” their dog. No way! If you take your dog to the dog park, you could unknowingly be setting your dog up to be one of the dogs that the unsocialized dog learns from! I’m pretty sure you don’t want your dog to be the guinea pig that a grumpy or inexperienced dog learns on! . Dismissal of real dog problems. Owners will frequently say “Let the dogs work it out,” if there’s a skirmish or scuffle. Sadly, that’s the wrong advice. We are guardians of our dogs. We take responsibility for their welfare. Letting dogs “work it out” can lead to veterinary emergency room visits or sadly, death. Google “dog park deaths” and you’ll find that there’s a real risk in taking your dog to a dog park. Health hazards. Parvo, bordatella, internal parasites, fleas, ticks, these are just some of the health risks your dog is exposed to at the dog park. Some of that risk is minimized if your dog is healthy and current on vaccinations, as well as if the dog park participants pick up the poop regularly and thoroughly. The American Veterinary Medical Association (AVMA) has a thorough list of communicable canine diseases here. Bad habits. Your dog can pick up the bad habits of other dogs in the dog park. Just like on the kids’ playground, bullying can also exist in the dog park. If your dog joins in on the melee, he could be learning inappropriate behavior that he’ll repeat outside the dog park. On the flipside, if your dog has a bad experience from the dog park bully, he may learn that going on the defensive early (growling, snarling, lunging, biting) is a good idea, even if a friendly dog approaches. In the end, most dog trainers realize that the risks of a dog park often far outweigh the benefits and we generally steer clear of dog parks. If one puppy is good, two puppies are great, right? Oh, so wrong. While it seems intuitive that getting two puppies at once might be a great timesaving idea, in reality that can be one of the worst things dog owners do. Raising littermates is harder than raising one puppy because everything you do with one puppy has to be done separately with the other puppy if you’re going to have two well-adjusted adult dogs. Instead of doing these with the two pups together, you have to do each of these things with each puppy, separately. Why separately? Because doing these things together leads the puppies to become dependent on one another. The more the pups depend on one another, the less they depend on and pay attention to you. They can develop an unhealthy dependence on one another that can make living with them unpleasant. House training. If you’re raising two puppies, you’ll need to teach them housetraining separately. Yep, that means taking each puppy out independently. Without the other pup. That’s two trips outside each time, in the rain, in the cold, in the snow, in the blazing heat…you get the picture. It’s double the work. Sleeping quarters. The pups need to learn to sleep apart (in another room) from one another. That means two crates, two beds, etc. Training classes. You’ll need to take each pup to his own class, without the other puppy. Creating independence is a critical task and it can’t be done if the pups are together all the time. Veterinary visits. When it’s time for their booster shots or wellness checks, make two separate appointments. Each puppy needs to develop his independence and confidence, especially with the veterinarian. Unless you want to bring both dogs to the veterinarian anytime one of them has an issue for the rest of their life, scheduling separate veterinary visits is a necessity. Training time. In addition to individual, independent puppy classes, you’ll need to spend time with each puppy separately to work with him on good manners. While it may seem more efficient to train them both at the same time, it’s actually setting the puppies back (the pups distract each other and also aren’t learning to focus and listen to your cues). It helps with house training. What goes in must come out. We use the scheduled feedings so we have scheduled and predictable bathroom breaks. We can immediately tell if one of our dogs is “off his food.” A dog refusing to eat at mealtime can be an early indicator that the dog might not be feeling well. If food is always available, it may be days before you notice your dog’s decreased appetite. Helps with training. Because our dogs work for food, we can use feeding time as a predictor of when our dogs will likely be interested in food. I can use all or part of my dog’s meal as training rewards. Every dog has to eat – you might as well use that food to accomplish some training. If your dog has continual access to food, it’s hard to gauge when he might be interested in training. 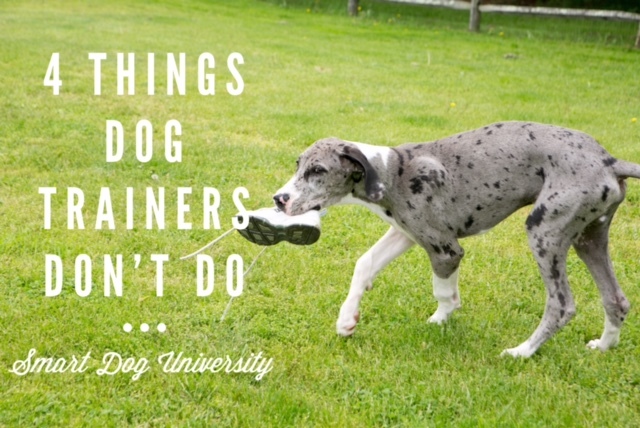 There you have it – four things dog trainers almost never do (and why). You may have never thought about these things before, but now hopefully you’ve got some things to think about and perhaps consider implementing with your own dog. Next month, we’ll take a look at some of the things almost all dog trainers do (that you might not).